While the unemployment rate for all people in the United States has edged itself below 8%, the rate for Veterans of the Iraq or Afghanistan wars hovers between 10-11%. For veterans of Gulf War II it is closer to 29%. And of course this number does not take account of the underemployed or those who have simply stopped looking for work and are homeless (conservatively estimated to be around 67,000 veterans). Surely we can do better than this. Actually, we ARE doing better than this. The numbers you are using do not paint an accurate picture of veterans in the U.S. According to the October Bureau of Labor Statistics report (http://www.bls.gov/news.release/empsit.t05.htm), the unemployment rate for veterans is 6.3%, which is LOWER than the general population rate, which is 7.4%. For Gulf War II (post-9/11) veterans, the unemployment rate is 10%. (I’m not sure where you got 29%). Iraq/Afghanistan-era veterans have a higher unemployment rate than the overall population because this cohort of veterans is younger than the general population. And ALL young people–regardless of veteran status– are more likely to be unemployed. So it is not fair (or accurate) to compare the unemployment rate of Gulf War II vets to that of the overall population. I think we need to be careful about using statistics in misleading ways, and manipulating them to tell the story we want to tell. It seems like many people want to make it seem like veterans are worse off than they actually are, because it confirms their disapproval for the wars in the first place. Robin: Thanks so much for your comment. If you are a regular reader of NCN you know that we take our use of facts very seriously and are not inclined to use statistics to “mislead” or “manipulate” so as to tell a particular story. That’s not to say that we always get them right either, and as you have pointed out the disparity between your numbers and ours raise some questions. Our numbers are BLS numbers too (including the 29% figure), but it turns out that they are over one year old. That is unfortunate error. And I am embarrassed by it; a mistake I can only credit to work too fast and too late at night. BUT, there are a few other points to make as well. First, it is the case that post-9/11 vets fare worse than the general population (and within that women are doing especially poorly at 15.5% as opposed to 9.5% for all vets). And it is not sufficient to say “the young” (or women) have different career paths or are generally more likely to be unemployed. Even if that is true, we are talking about individuals who put their lives on hold, and literally sacrificed their lives for the nation. That they return to civilian live and are told to sit at the back of the line because their age or gender demographic just doesn’t do very well is at the least cruel, but it doesn’t do much to support a strong military or a strong nation. Additionally we know that the BLS accounts neither for people who have opted out of the economy or who are underemployed to the extent of not making a living wage. Finally, I would point out that you take no notice of the statistics on homelessness among veterans. Those numbers fluctuate too and are notoriously hard to pin down, but I don’t think anyone wants to argue that there isn’t a related problem here. So even if we accept your numbers (and note one could argue that you were being misleading or manipulative by what you reported …. I’m not making that charge but noting how easy it would be to attribute motive without actually knowing your motive) we have a serious problem. One unemployed or homeless vet is one too many. I know we can’t achieve perfection, but surely we can agree with the sentiment of the cartoon and the sense that we should be doing better. To clarify, my interest in this topic comes from personal experience. Before coming to graduate school, I was a photographer/editor at the Stars and Stripes, a daily newspaper for U.S. military serving overseas. I used to receive all the Bureau of Labor Statistics press releases about veterans, as well as ones from the VA about homelessness, and I was always amazed to see how many news outlets cherry-picked the worst numbers, and often used them incorrectly and out of context. So this is somewhat of a pet peeve for me, but one that has driven me to try to understand WHY this happens. Overall, I do think many journalists are forced work quickly because of industry pressures, and as a result over-simplify statistics. In this rush, I believe decisions on what numbers to use and how reflect journalists’ cultural biases, whether they realize it or not. Rhetoric scholar Paul Acthter (2010) theorized that we use veterans rhetorically to symbolize our feelings about the nation. “Because their bodies are in a sense borrowed by the state for warfare, they are central to definitions of national identity–their health, their deaths, and their wounds serve as metonyms for both the nation’s health and for the condition of the war…The publicity of such bodies…calls attention to the human costs of war, and invites attributions for combat veterans’ injuries to state policies and policymakers” (p. 49). A common error in media reports is to assume that all veterans are combat veterans, and that the problems that veterans face are mainly due to their experiences in combat. Not all people who serve in the military go “downrange” in active war zones. Yet many media accounts (and your original post and follow-up) refer to “Veterans of the Iraq or Afghanistan wars” or “Veterans of Gulf War II,” suggesting you are talking about people who have served overseas in these two conflicts. But the statistics you use refer to eras, meaning people who served at the same time as these conflicts, not necessarily IN those places. (For example, my father served in the Navy from 1964-68, so he is technically a Vietnam-Era vet. But he never set foot in Vietnam, rather he spent that time on a ship in the Atlantic ocean, on call to pluck space capsules out of the water.) If you read the rest of that BLS report, it specifies that only 38 percent of Gulf War II- era veterans reportedly served in Iraq or Afghanistan or both. Overall, veterans who actually did serve in Iraq or Afghanistan had an unemployment rate of 11.6% — not great, but definitely not 29%. This is also true of homeless veteran statistics. They are reported in eras, not the physical location where the vets actually served. So not all Vietnam-Era veterans actually served in Vietnam (only about 45% did). So the stats about Vietnam-Era veterans are not necessarily talking about people who served in or near Vietnam. According to a report by the National Health Care for the Homeless Council, only one third of homeless veterans served in combat zones. But almost all news stories about homeless veterans start with an anecdote about a veteran’s combat experience. Doing this overemphasizes the role of combat experience as cause, while ignoring other factors, such as lack of affordable housing, drug dependence, education, unemployment, history of abuse, prison history, SES-background, and personal reasons. Basically, I agree with you that “one homeless vet or unemployed vet is one too many.” I am not saying we should ignore the many issues and challenges facing veterans. But misrepresenting their situation only does them disservice. Also, about that 29% from the 2011 report: If you look at it closely, that number did not represent all Gulf War II-era veterans, rather only male veterans between the ages of 18-24. This is a very specific demographic. First, it is unlikely that veterans in this category are college-educated. Most military service agreements are for 8 years, and involve at least 2 years of active duty. Since college generally takes 4 years, it is unlikely for a veteran to have graduated and be on the job market before the age of 24. Second, there are different reasons one can leave the service early, such as after being wounded, or being dismissed under other-than-honorable circumstances. 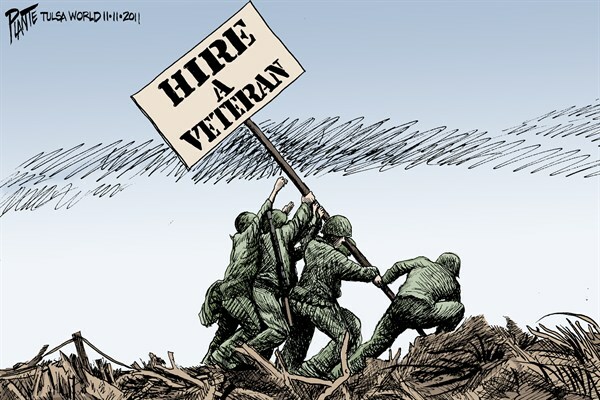 In short, there are many possible reasons for veterans unemployment in this specific category, such as lack of education, disability, or behavioral issues, in addition to the bad economy and challenges for young people in general to find jobs. The problems faced by this particular demographic are not necessarily the same as all Gulf War II-era vets.